One of the biggest criticisms of the modern-day WWE product is that, while the Superstars are better in-ring performers than ever before, the current characters on Raw and SmackDown Live are not as entertaining and captivating as past generations. In the era of Hulk Hogan and The Ultimate Warrior, in-ring talent was less important and there was a lot more emphasis on promo skills and the ability to sell fans on upcoming matches. Fast forward to the present day, the wrestling landscape has drastically changed and there is more of a focus on producing impressive in-ring performances, but there is also just as much need to keep the audience engaged through the art of promos. Nowadays, WWE Superstars are either handed bullet points to put into their own words before a promo or interview segment, or they are given a full script to read from which has been written by a member of the creative team. In rare cases, some performers have even gone off script – sometimes with permission, sometimes without permission – to get their character’s point across. With that in mind, let’s take a look at five times when Superstars delivered promos that were unscripted. 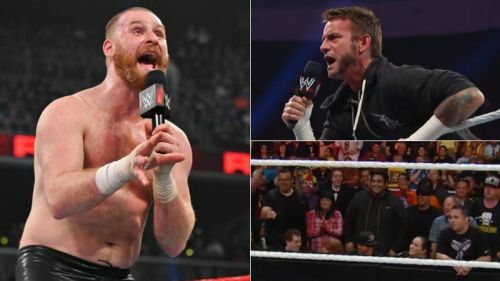 The inspiration for this article came from the episode of Raw after WrestleMania 35, which saw Sami Zayn return to the ring for the first time in 10 months to face Finn Balor in a losing effort for the Intercontinental Championship. Following the match, fan favourite Zayn soaked in the adulation of the Brooklyn crowd before hilariously informing them that he did not miss any of the fans or the “toxic WWE environment” while he was gone. Speaking on Busted Open Radio, WWE Hall of Famer Mark Henry revealed that Zayn’s post-match promo was not scripted.